Driving all around town shopping for holiday gifts is a resource hog – too much time, too much gas, too much hassle. That’s why I’ve turned to Amazon.com year after year to help reduce my trips into the seasonal chaos. And while this is a welcome convenience, all those boxes do generate a mountain of waste – think of how many shipments Amazon makes each holiday season! The cardboard box is 100% recyclable. Store the broken down boxes with your other cardboard, and take them to a Charleston County Recycling drop site for recycling. Recycle the invoice. There really isn’t any personal info on the invoice that can’t be found via Google, so toss it into your blue bin with your other paper recyclables. If you’re worried about identity theft, shred then recycle. Amazon.com marketing materials are recyclable too. 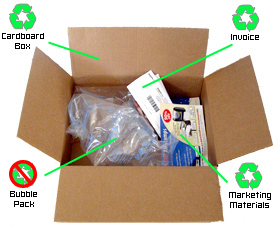 Yep, those glossy paper pamphlets they throw into the box are 100% recyclable. So after you’re done reading about Amazon Prime (a great program BTW), toss those brochures into your paper recycling bin. Recycle the brown paper padding. Some boxes will come from Amazon.com stuffed with crumpled brown paper to protect your purchases. This material is similar to brown paper bags, and can be put in with the rest of your paper recycling. Dream of recycling the plastic #4 bubble padding. OK, this is the one thing from your Amazon.com purchase that can’t be recycled (along with the shrink wrap around book orders). Unfortunately, plastic #4 isn’t collected in our area. In the end, I have to give Amazon.com credit for using recyclable materials – except for that #4 bubble pack (Hey Amazon…get on that!) The good news is we can all help keep this stuff out of the landfill. So as the packages start showing up these next few weeks, stop to think how their contents could end up in your blue bins instead of your trash bins – and make it happen. Happy holiday recycling! veterinarian. Eventually this can cause hair thinning or patches of bald spots. simply because of its vantage position proper in front of the face. You might add a video or a related pic or two to get people interested about what you’ve written. POUR PLUS DE FUN? VISITEZ NOTRE SITE :D!